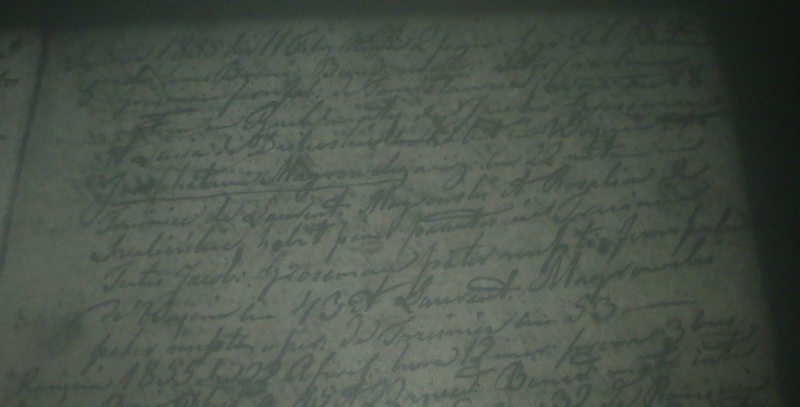 Here is the place where you can upload scan or picture file of your ancestors record handwritten in the old Latin with request of translation it into English. I've had a copy of this record for quite a long time and have never been sure about the content of the record. I hope that a translation will clarify the contents. Thanks very much. On the 24th day of January in the year 1879 Maciej (Matthias) Szafranski, the father of the deceased declared that on the 22nd day of January of the current year Maryanna his and Jozefa (Josephine) Switala's daughter, legitimately married, had died. She lived one month and 23 days. - are the words after Laurentis Magrowski and Rozalia "obit .... parentis in Trzciniec (sure about the place)" ? - Laurentis was surely 61 by then. However, I read the number 53 after his name. Does it mean he died at the age of 53? The scan is very difficult to read due to the poor resolution of the image together with the ink from the other side of the page bleeding through, so there are no guaranties about the accuracy of the reading. If you have a clearer image it may be possible to give you a better answer. However, to answer your questions...it looks like the name of the groom is Casimirum (Kazimierz) and it looks like his age is 23 or possibly 33. One thing that is clear is his occupation: ferri faber, an iron worker or blacksmith. Rozalia's surname looks like Trulinska. The name of the village is not clear either. I can make out "Trz??wice". Does that make any sense based on the location of the parish where the marriage took place? There is no mention of any death in the record. What you read as "obit" seems to actually be "habet" and refers to the bride having the permission of her parents for the marriage. If the word were a reference to the death of Lawrence (Wawrzyniec) it would have to be the third person singular of the perfect indicative active which would be either obiit or obivit. The age 53 is the age that is given for Lawrence and it is very possibly his correct age since Josefata (Josephata), the bride is listed as being 22 years old. The witnesses are listed as Jakub Grosman who is listed as the brother of the groom and his age is listed as 43 and his occupation is also ferri faber. The groom's father and brother both had the same first name. Lawrence is the other witness and he is both the father of the bride and one of the official witnesses. If you can post a clearer image I will be happy to look at the record again. Hope this will be of some help to you. Thanks for your help. I am not good at editing images, so the one attached is just a bit better than the other. I was mainly interested to know if Jozefata's parents were dead or alive, because it will help me narrow my search to find Wawrzyniec's death record (and marriage, too). The village they lived was Trzciniec, near Raciecin, parish in Broniszewo. 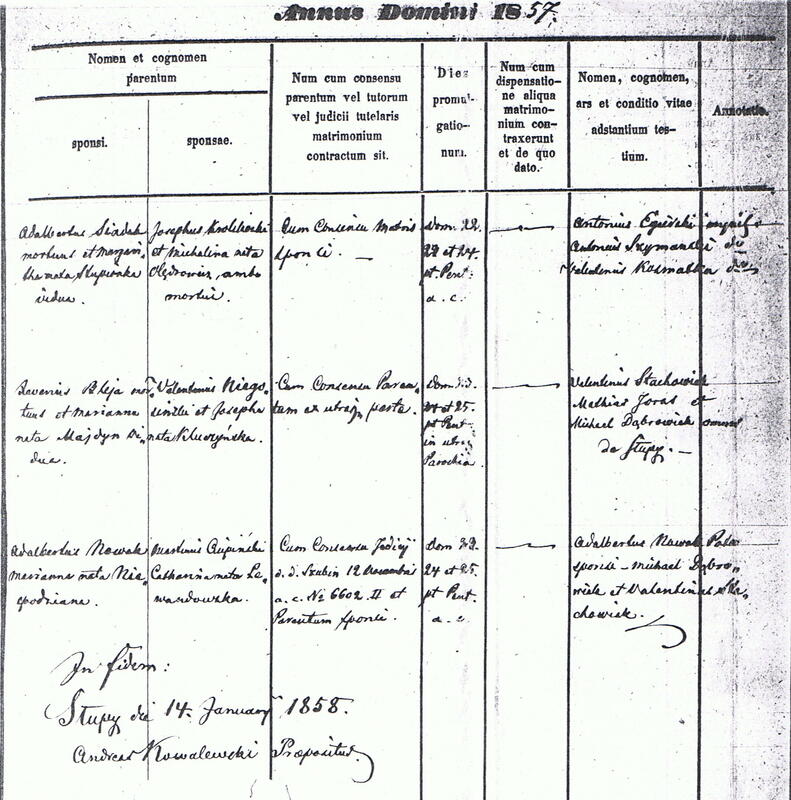 Wawrzyniec was born in Branno, in 1794, so his age on this marriage record is incorrect. Just curious to learn that a woman at 22 needed her parents's agreement to get married. I thought it applied only to brides under age. I wasn't able to find any new information from the second scan. I don't know that it is possible improve the quality of a scan by editing. I believe the problems with the scan come from the exposure setting and the angle at which the record was photograph taken. Both Wawrzyniec and Rozalia were alive at the time of Josephata's marriage. A hint when looking for their marriage record---marriages generally took place in the parish of the bride so the parish where she resided would be the place to look. According to Catholic Church law (which is still true today) the pastor of the bride had the right to solemnize her marriage. The reason for this was and is to level the field. Some pastors are more popular than others and would therefore be the person the couple would choose. To prevent popular priests from getting all the wedding business the rule was for the priest of the bride's parish to have the right to have the wedding take place in his parish. Of course, he could delegate that right to any other priest, which happened in the past and still does today. The consent (permission) of the parents was not so much required by law for brides who were older, but it was more a matter of custom, a custom which also extended to the groom. Kazimierz didn't get his parents' permission because they evidently were deceased. Marriages were considered a family affair and not just a romantic attraction between two young people. While marriages often were affairs of the heart, they were also contracts which were to benefit the families of the young couple. This view continued not only in Poland, but also among Polish immigrants in America. My mother's uncle Pete who was born in Chicago in 1891. He never married (according to my mother) because his widowed mother didn't like the girl he wanted to marry and would not give her permission for the marriage. Although Pete was over thirty, he was unwilling to go against his mother's wishes. If I can be of any help to you in the future, don't hesitate to ask. The two pages of entries for marriages in the parish of Slupy in 1857 contain examples of consent for marriages of individuals over 21 years of age. The marriage register from which the pages were taken is rather typical of the format and contents of marriage records as recorded in the German Partition after 1820. 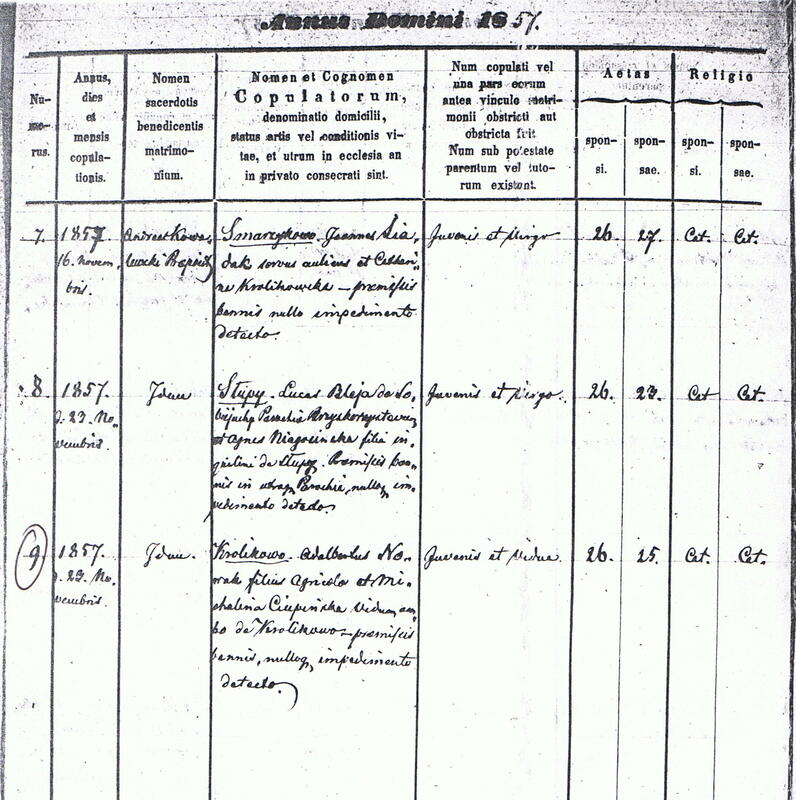 The headings of the columns indicate what information is to be recorded in each column and can often lead to information which adds depth to the simple facts of the marriage record. For marriage entry #7 the record states that the mother of the groom gave her consent. The previous sub-columns provide an explanation of why only she gave her permission: the father of the groom and both parents of the bride are listed as deceased. For marriage entry #8 the record states that both sets of parents gave their permission. For marriage entry #9 the record states that permission was granted by a judicial act in Szubin (the seat of the gmina) and also by the parents of the groom. The entry lists both the date and the record number of the judicial act. If the records of the judicial acts are still extant the act may provide interesting and/or helpful information. 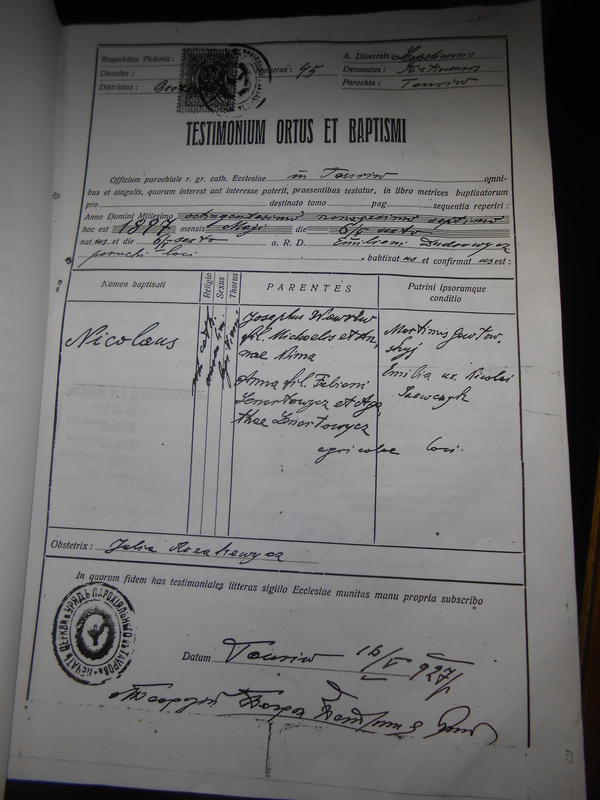 I have some death records and a marriage record which I would like translated. Thank you. Also, I have a record which the LDS film seems to list as Confirmation Records. I would just like to know what the page actually records. Thanks again. Posted: Tue Mar 19, 2013 4:52 pm	Post subject: Confirmations ? The record is not a Confirmation list. It is a list of those making their Easter Confession. The actual list of names is in Polish followed by the person's status. The first name on the list is Maryanna Ratayczonka whose status is listed as corka (daughter). She is the daughter of whoever is listed on the previous page. Her father's surname is probably Ratayczyk. The extra syllable in her name is an old usage for the sake of euphony. I Piotr Zalenski, the curate of Gluchowo, blessed the marriage between the newlyweds honorable Tomasz Ratayszak, a single young man, a shepherd from Mikoszki, and the honorable Zosia Michalska, a maiden from Mikoszki after the three marriage banns were published in the parish church of Gluchowo in the presence of the people gathered for the celebration of the sacred rites on the 22nd Sunday after Pentecost on November 3, the 23rd Sunday after Pentecost on the 10th of the same month, and the 24th Sunday after Pentecost on the 17th of November, and after no canonical impediment was detected. The witnesses of this marriage contracted in the presence of the congregation were Wojciech Stelmaszek with his consort Agnieszka from Mikoszki, Kazimierz Woyciechowski a shepherd from Bonikowo with his consort Maryanna, and many more persons of both sexes gathered for the Sacred Devotions on Sunday. The groom: age 28; the bride: age 20. Jarogniewice the 20th day of July 1811 died the boy Piotr, the son of Pawel & Maryanna Skicki, legitimately married in the Catholic faith, attacked by an unknown disease, age 23 weeks, who was buried on July 22 in the cemetery of the church in Gluchowo. 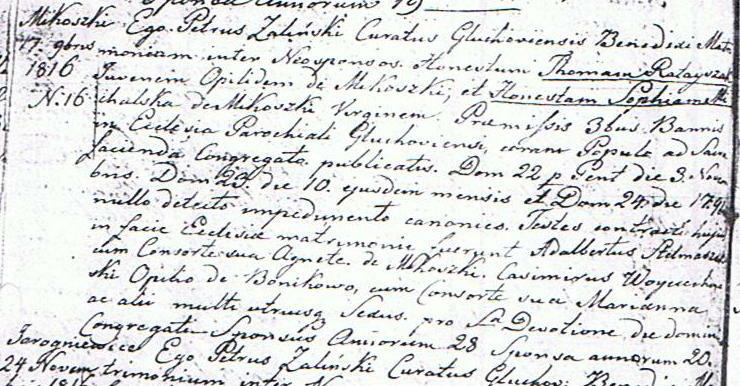 Bieczyny #5 January 6, 1818: An infant by the name of Helena died on the 4th of this (month) at noon, the daughter of Tomasz Kuligowski and Franciszka, laborers, 2 years of age, of scarlet fever. She was buried in the cemetery of the church of Gluchowo (on January 6, 1818). I would like to have your oppinion about Nicolaus' surname (Mikołaj, in polish, I assume). Wauróf, Wanruf, Wawruw (as translated by a friend of him, who was also born in Ukraine), Vauruf (as he himself signed). In www.herby.com.pl I have found Wawrów, which was the closest match I could find. However, their location was mostly in places close to the German border. On the other hand, the document below was issued in 1927 and it is possible that people from that area were resettled. His place of birth was Taurów (now in Ukraine) but I still would like to know what dekanat is that as well as the polish name for Leopoliensis diocesesis. I can read the other names and surnames. His place of birth was Taurów (now in Ukraine) but I still would like to know what dekanat is that as well as the polish name for Leopoliensis diocesesis. Diocese is Lwow (Leopoliensis is one of names of Lwow). It's indeed parish Taurov (can read cyrillic on the stamp), in Ukraine. Ukrainian word is cerkiew, not church. I do not know if there is much difference between Greco-catholic and Roman-catholic Latin documents, but dekanats might be in different places. Concerning Roman-catholic parishes and dekanats I found this excellent document, where there is a number of cities listed, but do not see anything close to the name on your jpeg. I am looking forward for Dave's note.